Cabasse launches 'fully digital intelligent' statement speakers | What Hi-Fi? The most striking thing about the speakers may be the spherical enclosures, each containing a 23cm triaxial drive unit derived from the company's La Sphére speaker with a 38cm woofer, and mounted on a sculptural stand to give an overall height of 1.2m. But that's only part of the story. They're fully active, and driven by four digital amplifiers per channel, housed in the base of each speaker. There's 1KW for the bass unit, 500W each for the low-mid and high-mid drivers and 250W for the tweeter, and the amplifiers are controlled by digital signal processing using technology derived from Cabasse parent company Canon. This allows adjustment of frequency response and crossovers to adjust the speakers to the room in which they're used, using the Cabasse Room Compensation System. The speakers are connected to a preamplifier/CRCS controller unit by optical digital interconnects, and the controller/preamp has both 96kHz digital and analogue inputs: two optical, two coaxial electrical and one AES-EBU digital, with two standard line ins and two balanced XLR ins. All analogue sources are converted to digital before being passed to the speakers, and the controller unit comes complete with a calibration microphone to set up the speakers in the room. 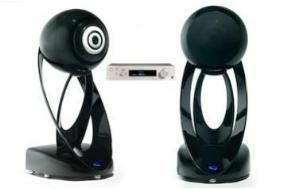 The L'Océan speakers will be available in Spring 2011.